(Olalla, WA) – Rookie author Robert D. Calkins (www.robertdcalkins.com) has released the first trio of books for children and adults inspired by his work as a search-and-rescue dog handler in Western Washington. The Spring 2016 release of Sierra Becomes a Search Dog, Sierra the Search Dog Finds Fred and Digger—Sierra and the Case of the Chimera Killer gives parents a chance to read the kids to sleep, dim the lights, and then curl up with a darker mystery novel involving the very same characters. Calkins knew he was taking on a big task to write for all age levels simultaneously. The title character Sierra takes the name of Calkins’ first working dog, who searched for both live subjects and human remains (cadaver). 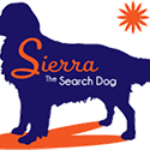 Sierra Becomes a Search Dog is a fictionalized account of how little Sierra excels at the game of hide and seek, and puts that skill to good use when a little neighbor girl goes missing. Illustrations by artist Taillefer Long bring Sierra to life in a way that both children and adults will enjoy. Digger, for grownups, is inspired by Sierra’s work as a cadaver dog. In the story Sierra is paired with 17-year old Bryce Finn, the youngest search dog handler in Washington State. The two of them end up one step behind whoever is dumping bodies in rural Kitsap County, and one step ahead of police trying to unravel the mystery. In real life, Calkins has been a volunteer search dog handler in Western Washington for more than a dozen years. He and his dogs have worked everything from routine missing person cases, to homicides, to the 2014 mudslide in Oso, Washington. In 2015 he retired from his position as spokesman for the Washington State Patrol to write full-time. Editors: Bob is available for interviews at (844) 344-4374. Five Things to keep your children safe from strangers, without scaring the daylights out of them. Five Ways to stay safe on day hikes. The Ten Essentials– How to keep these critical safety items small, light and inexpensive. K9 Search and Rescue– the story of how humans and K9s work together to get missing subjects back to their worried families. One man’s journey to becoming an author and the challenge of writing for multiple reading levels simultaneously. Bob is an experienced interview subject and is available nights, weekends and on short notice. The Sierra the Search Dog spectrum of books. Sierra Becomes a Search Dog – The story of a little Golden Retriever puppy who excels at neighborhood games of hide-and-seek. Sierra turns that skill into a life-saving act when a little neighbor girl goes missing. Sierra the Search Dog Finds Fred – Ted’s friend Fred goes to the store to buy some bread, but doesn’t return. Is he under the bed? In the shed? Sierra uses Fred’s stinky shoe to follow his scent, and her discovery has everyone dancing. Sierra the Search Dog Saves Sally (Coming soon) – Sarah and Sally are sweet sisters who do everything together. But while Sarah is sewing, Sally slips off to the shore to look for sea shells. When Sally falls and hurts herself on a trail, Sierra is called to locate the little lady. Bryce Bumps His Head (Coming Soon) – Dana is a Girl Scout who gets separated from the rest of her troop while hiking in bad weather. The search is a dangerous one, and Sierra ends up rescuing two people that day. Bryce Bumps His Head is a fun book that also explores the topics of safety in the woods, respect for others and leadership. I Need a Search Cat (In Development) – A little developmentally-disabled girl goes missing, and Bryce and Sierra think they know exactly where to look. It turns out they set their sights a little too low. I Need a Search Cat shows Bryce’s skill at working with his dog, sensitivity toward those who are differently-abled, and how to manage conflict with important partners. Digger, Sierra and Case of the Chimera Killer – Bodies are continuing to turn up in the woods around Kitsap County, Washington. Sierra, in her role as a cadaver dog, works many of the scenes and her nose reveals important clues. Bryce and Sierra remain one step behind the killer, and one step ahead of police in trying to unravel the mystery. Along the way, Bryce meets and nearly loses his first love and learns the manly art of saying “yes, dear” at all the right times. The “Sierra the Search Dog” spectrum of books is available on Amazon.com and is coming soon to local book stores. For a review copy of any title call 1-844-344-4374 or e-mail Robert@calloutpress.com. Next Article Live Find Dog? Or Cadaver Dog?